In Part Two of this special online feature, Emma Sutcliffe talks to Frank Mitchell about how an extensive collection of historic glass plate negatives from the goldfields town of Castlemaine, Victoria, revealed the stories of railway employees from the late 19th century. If you missed out on Part One, which delves into the recovery and restoration process, click here. Sometimes, inspiration can come from the unlikeliest of places. For railway enthusiast Frank Mitchell, it was a group of ‘carte de visite’ images that fired his imagination and started his latest railway history project. “I was familiar with some Verey images from a private collection, but it wasn’t until I visited the Central Goldfields Local and Family History Library that I learned the remarkable story about the survival and rescue of the Verey Collection,” Frank says. “And when I discovered photos of the employees of the Victorian Railways, I thought I’d like to research the men pictured,” he explains. Victorian Railways Employees photographed by Verey, 1897. Courtesy Verey Collection and Frank Mitchell. His aim was to ‘flesh out’ the histories of those employees captured by Adolphus Verey and his camera, in order to construct a narrative around the images. Titled Castlemaine and Bendigo Railway Staff in the Queen’s Jubilee Year 1897, Frank’s research uncovered, in particular, more about Stationmaster William Hughes, pictured in the centre of a group of colleagues. Born in Liverpool in 1849, William Joseph Hughes emigrated to Australia with his family four years later, eventually taking up a position with the Victorian Railways in 1864, a job in which he excelled. The Mount Alexander Mail dated 1 February 1897 notes the transfer from Castlemaine to Maryborough of the “highly esteemed Railway Stationmaster, William Hughes” and, as Frank puts it, preliminary research of Hughes’ family background indicated “a well-educated lad with good prospects to improve himself”. 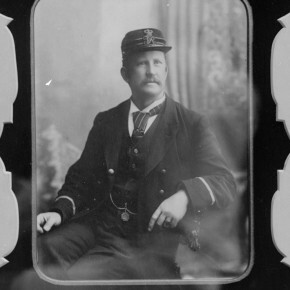 To discover more about the other ten employees of the Victorian Railways Traffic Department in 1897 whose portrait photographs were amongst the Verey Collection, Frank consulted the birth, death and marriage register, the electoral rolls of 1899 and 1903 and the Victorian probate lists. HV Gazzard, a shunter, 1897. Courtesy Verey Collection and Frank Mitchell. 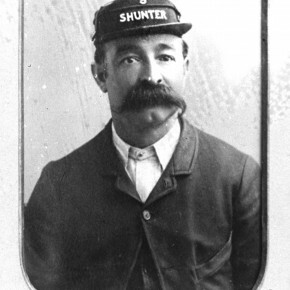 Railway Stationmaster William Hughes, 1897. Courtesy Verey Collection and Frank Mitchell. 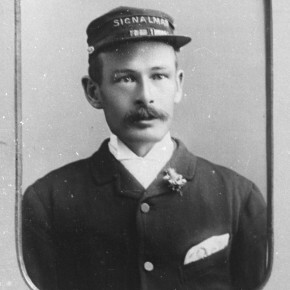 D Bedford, a signalman, 1897. Courtesy Verey Collection and Frank Mitchell. This included Porters E Kennedy and MJ Thorpe, Head Porter R Smith and Parcel Porters JH Cook and W Piper. Also listed in Frank’s research are Signalman D Bedford, Shunters HR Overall, HV Gazzard, Signalmen TJ O’Dea, T Pollard and F Sutton, Goods Clerk WM Davey, Train Examiner J Jones and Assistant Stationmaster JR Beggs. The only man in the group to remain a mystery is a signalman listed as “Cluming” on Verey’s glass negative plate. “My best guess is that this is actually Simon Clunning, from a family of timber and sleeper cutters of the Bullarto / Daylesford forest area. It seems likely he is our man, as his brother Michael joins the Railway on 23 October 1901 at the age of 26 as a porter, and by 1917 is employed as a signalman too,” says Frank. 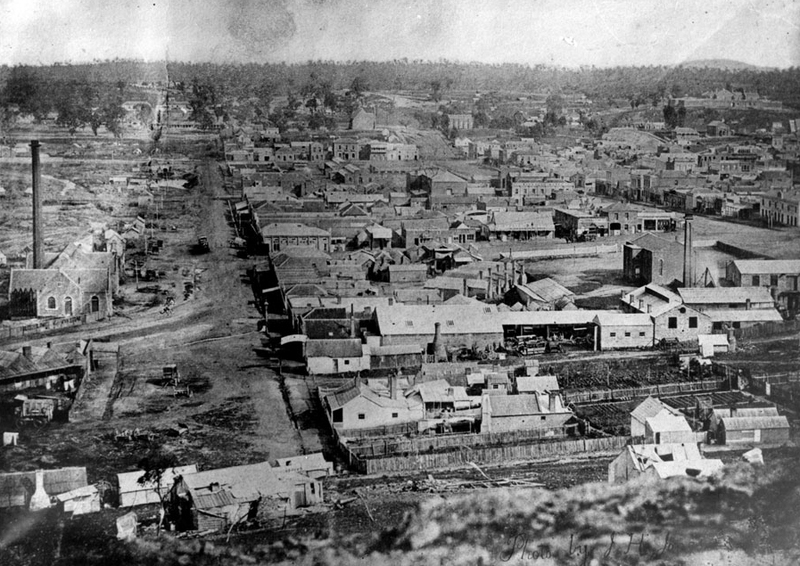 View of Castlemaine in the early 1860s. Courtesy Verey Collection. “This access to the collection also allows re-interpretation of the past by a wider audience, some of whom may have a better understanding of the subject matter than currently exist,” says Frank. Frank Mitchell has recently commenced another railway project looking at the pioneer railway staff in Bendigo. To learn more about the Verey collection and see some of the beautiful images, click here. Inside History would like to acknowledge and thank Frank Mitchell for his assistance with this story.